For the cat lover on your holiday shopping list, I can think of no greater gift than a CatLadyBox. Each month's box is stuffed full of feline fabulousness featuring unique cat-themed items hand-picked by cat ladies for cat ladies. Subscriptions cost $34.99 a month, but you can get an even better deal if you prepay for 3 or 6 months. 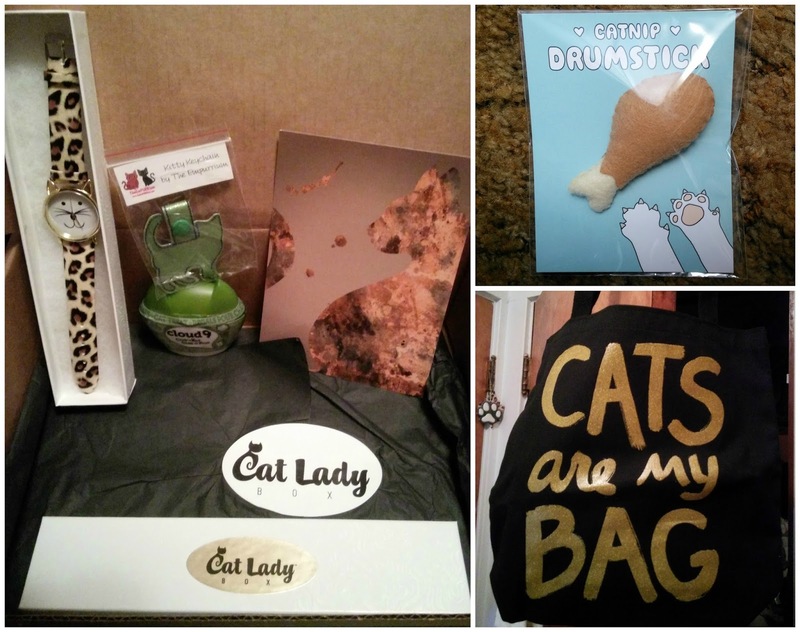 Also available is the Crazy CatLadyBox, which includes a couple surprises for your kitty! The CatLadyBox Gift Shop is now open! The holiday box must be ordered by 12/14 for delivery by Christmas. With a gift subscription your recipient will get a gift voucher email and they must click the link to claim the gift. CatLadyBox donates 5% of all profits to cat rescue organizations each month. 1) Purple Craze Cat Lady T-shirt I wear my cat lady status proudly, and it's purple!!! 2) Deluxe Fuzzy Cat Ears by sugarlux Yes, I wore these to work on Halloween! 3) Kitty Cameo Ring by Ms. Formaldehyde This ring is *exquisitely* beautiful. I gasped when I pulled it out of the box. 4) Black Catnip Cat by crochetkittycattoys This toy is so cute that I debated giving it to Mudpie. I caved, though, and she had it's feathery tail sopping wet in minutes! (Check out the video below!) I have more shopping to do from this Etsy shop, too. 5) Junkfood Flyers from Hauspanther I wish I was crafty and could come up with cool ideas like this. These toys are made from recycled cat food bags cut into fun shapes and combined with felt circes, the perfect shape for scooting across the floor! 1) Cats Are My Bag from Xenotees This shop has the cutest cat stuff! Use the code SAVE15 to save 15% off your next order until 12/31. A girl can never have too many cat totes or tees, in my opinion. 2) Triple T Studios Cat Watch I hope the leopard print craze never goes out of style, because I would have to do away with half of my wardrobe! Love this watch. 3) Cat Keychain by The Empurrium I don't know about you, but when I'm out and about running errands, getting frustrated by holiday traffic, a glitzy and fun keychain is sure to put a smile on my face! 5) Cloud 9 Treats Mudpie has tried these treats before and loved them, so she was very excited to get more. And have you ever seen a cuter cat treat container? 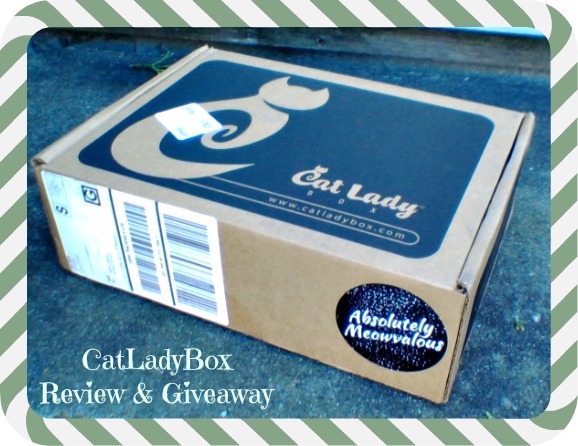 I have an extra unopened November CatLadyBox to give away to one lucky reader in the US! To enter simply fill out the Rafflecopter below, and good luck! Disclosure: I'm a proud CatLadyBox subscriber and have been reviewing my box each month without compensation. This month I received an extra box to give away and a one month renewal to my subscription in exchange for a review. 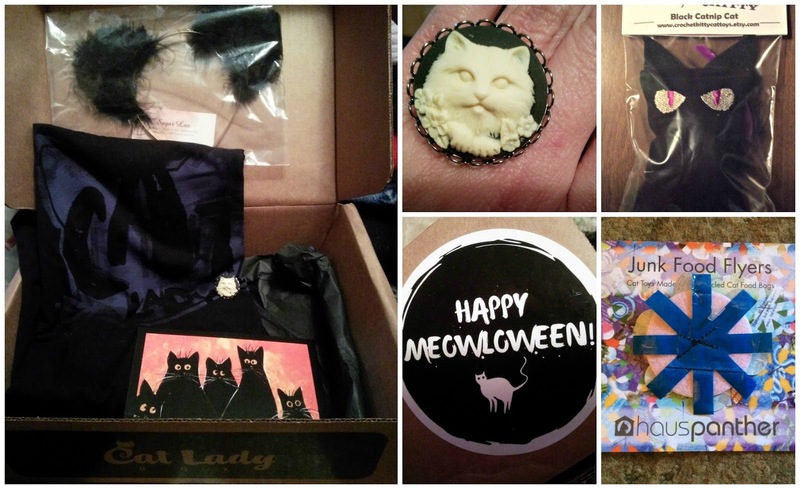 Cat Lady Box is such a great idea! The mom got to review one a few months ago and loved it. I do not subscribe to any subscription boxes at this time, but I have in the past! Loved Mudpie's video and pic! Those were great boxes of goodies. I love the watch in the November one. That's really awesome, Melissa! Has Mudpie checked out her November toy yet? How does she like her treats? We don't subscribe to any boxes. But these are the best we've ever seen! We subscribe to Nerd Block and Loot Crate and look forward to new toys every month. I don't subscribe, but would love to if we had some extra money. Every time someone reviews a box I want one even more. Thanks for the giveaway. My granddaughter and I consider ourselves cat ladies and give each other gifts with cat themes. This would be fun to give her this box. I do not subscribe. I've never had a box subscription---but it sounds like fun. I don't subscribe to any boxes, but I should! Great review. Hey, Mudpie, do you like that junk food flyer? That's one of Newton's favorite toys! She adores both the Cloud 9 treats and the turkey drumstick toy! Wow, these boxes are truly amazing! I didn't know there's so much neat kitty stuff out there for both humans and kitties! We saw how much Mudpie liked that black kitty in the video. :) Also, we're glad to see above that the drumstick has been recovered! Mudpie, I didn’t know you had an orange footsie! How cute! At the moment I do not have any subscription boxes but I have in the past. Yes, I really love The All Natural Face sub box. I currently subscribe to the monthly Pet Treater subscription box for my dogs. Those Cat Lady boxes are amazin' Mudpie. We hadn't seen da October one, how cute. You sure did luv da black kitty huh?. We think they are fur sure gweat gifts. Have a pawsum weekend. I don't but a great idea. no i have never done any of the subscription boxes. they are a great idea, but costly and not really need what they offer. I have never done any subscription boxes before, cute! I have never done any subscription boxes, I have been considering it though. I don't subscribe to any boxes, but I definitely want to when I have more disposable income!